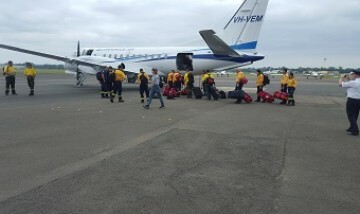 Over recent weeks we were tasked to assist in crisis situations across Eastern Australia with a number of charter flights, utilising our aircraft to support emergency operations. 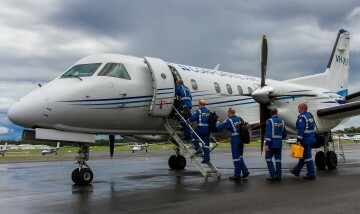 On these occasions, our 34 seat Saab 340B Plus and 19 seat Metro 23 aircraft offed the flexibility to transport specialised personnel and all of their equipment, in speed and comfort over long distances and at short notice. The B Plus variant of the Saab 340 specifically incorporates improved passenger comfort, cabin styling and baggage stowage, reduced cabin noise level and excellent short runway performance through fitment of extended wingtips (WT). 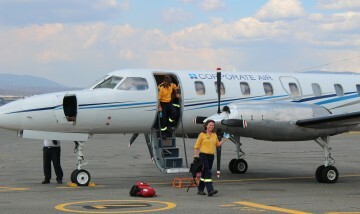 With our fleet of 12 aircraft (carrying 5 to 34 passengers) and aircrew based across the Eastern seaboard of Australia, we can be airborne at very short notice in an aircraft of a size tailored to the role. Our aircraft are also well equipped to operate into grass, gravel or dirt airstrips in regional and remote locations and often directly to the required destination. Our friendly consultants are available 24/7, 365 days per year to assist you.